I am one person trying to make a difference. My goal in creating this website was to create a "hub" where individuals and divergent groups could come together and make the efforts of those trying to help animals in Kentucky and elsewhere more efficient by communicating and sharing needs, information, and ideas on one site. My goals: People would have access to information about the plight of animals and could use the site to discover information and resources they did not know existed. By helping one another and networking in a more efficient manner, time would be saved and duplication of efforts would be eliminated. Transports would be created and filled more easily. Those with more resources could help those with fewer increase their ability to save animals. People not involved with rescue would be educated about the problems that exist and discover what they could do to help. This quote by Henry Ford expressed what I believed could be achieved by unity of purpose: "Coming together is a beginning. Keeping together is progress. Working together is success." Unfortunately, my detractors, those with their own agendas, have somehow felt threatened by me and have done their best to ensure this website would fail and to damage my reputation. They have spread lies, misrepresented facts, and made assumptions based on nothing but their own perceptions, without taking the time or making an effort to discover who I am. This website is not affiliated with any group. It has no agenda other than helping to solve some of the problems in Kentucky, states that share a border with Kentucky (Illinois, Ohio, West Virginia, Indiana, and Tennessee), and other states that share common problems. Many days I feel overwhelmed, sad, and frustrated. It would almost be a relief to walk away from the website, to never have to look at the sad face of another unwanted animal who most likely will die in a kill shelter, to ignore the emails begging for help, and to not have my sleep disrupted by the thoughts of the work left undone and the ones who will be killed the next day because not enough people care. 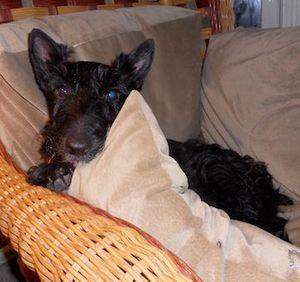 IN JUNE 2011 one of my Scottish terriers, Ballantine, was diagnosed with cancer of the lower jaw. She was six years old and my sweet Bally girl. The diagnosis took us completely by surprise since Bally had been given a clean bill of health two weeks earlier. Bally underwent surgery at the veterinary center at Ohio State University in Columbus, OH on June 17th, 2011. She left us March 2nd, 2013. Below is her story and legacy. 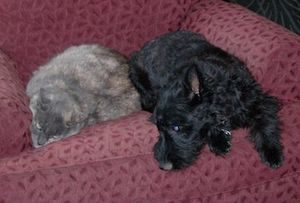 Bally with Paws - one of her kitty buddies - who died May 2010 at age 14. 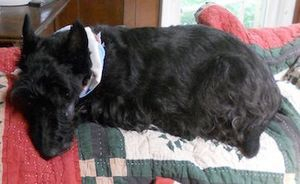 On June 4, 2011, ONE OF MY SCOTTISH TERRIERS, BALLANTINE, was diagnosed with cancer of the lower jaw. She is six years old and my sweet Bally girl. The diagnosis came as a shock. Bally had a visit with her vet on May 19 and was diagnosed with a minor ear infection. Exactly two weeks later I rushed her back to the vet because she suddenly developed loose teeth and bleeding gums. That evening the vet gave Bally a death sentence - Bally had cancer of the jaw and should be immediately euthanized. The cancer was very aggressive. In a short period of time I had to learn everything I could about this terrible disease and make a decision. I chose to find possible treatments that could extend Bally's life...which took us to the Veterinary Medical Center at Ohio State University. BALLY'S STORY AND DAILY UPDATES ARE BELOW. 2005 - Bally (right) and her brother Pinch - The day we adopted them from a rescue. May 19, 2011 ~ Something is wrong! Took Bally to the vet because she was not acting like her usual active self. The vet diagnosed a minor ear infection and prescribed an antibiotic and ear drops. During the visit the vet mentioned that Bally's teeth had a little tartar, but were in very good condition for her age. JUNE 2 ~ Bally seemed to be acting like her old self, but her teeth looked different to me. My family claimed I was imagining things. JUNE 4 ~ DEATH SENTENCE! This morning my son noticed that Bally's salvia had blood in it. We immediately took Bally to the vet. She had a temperature of 104 degrees and the teeth in her bottom jaw were loose. Her gums were bloody. The vet said we should leave Bally overnight for further tests. Saturday evening the vet called and advised us that Bally had cancer of the lower jaw. Blood tests were normal, but the X-ray showed that Bally's lower jaw was disintegrating. The vet did not perform a biopsy, but advised us that Bally should be immediately euthanized. I declined the recommendation. JUNE 5 ~ BALLY IS HOME! Sunday morning my husband brought Bally home. She is currently eating, drinking water, and showing some interest in her usual activities. She does not appear to be in any pain, but the vet prescribed more antibiotics and pain pills if needed. Bally's teeth are loose and her mouth is bloody. At the moment I am in shock, heartbroken, and don't know which way to turn. I have done some research online and have posted to on my Facebook pages asking for assistance and advice. Several people have suggested that I get a second opinion ASAP and that this should be from a veterinary oncologist. None are located in Kentucky. I live in Louisville. I assume that Bally's cancer is very aggressive since her symptoms appeared in such a short period of time. JUNE 6 ~ LOOKING FOR HELP! Posted about Bally on the KY_CENTRAL website, to Yahoo groups and on Facebook seeking help, suggestions, advice, and comments...anything that will give me some answers and hope. JUNE 7 ~ I have joined the Bone Cancer Dogs Yahoo group https://groups.yahoo.com/neo/groups/bonecancerdogs/info and I am still seeking information so I will know what options, if any, are available. JUNE 8 ~ ONCOLOGIST REFERRAL ~ After several phone calls which left me frustrated, angry and in tears, Bally's veterinarian is giving us a referral to a vet school so Bally can get an evaluation, further tests, and hopefully, a second opinion that provides possible treatment and not a death sentence. Two schools have been recommended - The University of Tennessee in Knoxville and Ohio State in Columbus. Both are approximately the same distance from Louisville. I have received a lot of advice and at the moment feel overwhelmed. I know the clock is ticking, so I can't delay in making some decisions. There is so much information and not enough time to research each option. Therefore, I must rely on the expertise and experiences of others. I realize that every situation is different. This is what I know at the moment. Bally is only six years old. She has never had any problems prior to this. She is still eating, drinking and showing an interest in life, despite her loose teeth and bloody saliva. She does not appear to be in any pain. Her coat is glossy, she is of a good weight for her size, and her blood work was good. I do not know what kind of cancer she has. The vet sent her home with 15 Tramadol pills and 20 Ampacillin pills which will only last this week. I know I do not plan to return to the vet who made the diagnosis other than to get copies of Bally's X-rays. This morning I plan to contact CSU's consulting service to get a recommendation. A veterinarian has recommended a veterinary oncologist in Indianapolis because it appears to be the closest place with a board certified veterinary oncologist. My stomach is churning and I feel like my feet are in cement. I know I have to do something now. Thanks to everyone who has shared and given me advice. 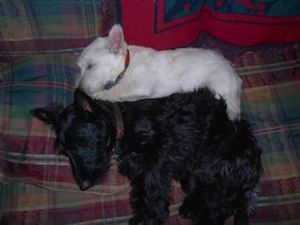 I lost my two senior dogs, Cutty Sark (Scottie) and Windsor (West Highland White Terrier), 10 days apart six summers ago. I had to make some terrible decisions and some I have come to regret. Neither had cancer. Bally is young and deserves a chance. In the end I know I must think of her and the quality of her life in any decision I make. JUNE 9 ~ APPOINTMENT CONFIRMED ~ Bally has an appointment at Ohio State Monday morning so she can be evaluated by a veterinary oncologist. Please send good thoughts to Bally. She deserves a chance. JUNE 12 ~ Bally was a little listless yesterday and you can smell the infection raging through her, but she is still interested in going outside, so I am trying to stay positive and focus on our Monday appointment. Megan from MI, one of my online friends, has created a chip-in for Bally. She has been a lifeline for Bally and me. JUNE 13 ~ CONSULTATION AT OSU VETERINARY CENTER ~ Today was a very long day. My son and I left our house at 6:30am and we returned home after 8:30pm. Some Good news - the cancer has not spread to Bally's lungs. The vet oncologist suggested they would know more if they performed a CT scan and I gave my permission. Bally will receive anesthesia at 10:00am Tuesday and undergo the scan. At that time they will examine her jaw more closely, look at her tongue and lymph nodes, and possibly do a biopsy. They said they couldn't tell what kind of cancer she has from the X-ray, but something is growing very quickly and her jaw is strange looking because it fractured...just like the leg of a dog that has cancer. I had the option of taking Bally home and driving her back to the clinic early this morning, but I thought all the moving around would be stressful for her. The veterinarian who examined Bally called me while I was driving back to Louisville. She said Bally ate half a can of dog food and a jar of baby food. They were keeping her in a quiet area near the ICU so someone can keep an eye on her and someone was coming in at 10:00pm to give her medication and to take her for a walk. At the moment I am relieved that Bally appears to be in good hands and we will take it one day at a time and make any decisions based on her quality of life. I want to thank everyone who has donated to Bally. A $1 contribution is much appreciated...To me it is a sign of support...emotional and financial. This path would be even more difficult to face if I knew decisions had to be made on the basis of money. JUNE 14 ~ TEST DAY: Just spoke with the vet at the OSU Clinic. Bally is awake from anesthesia and I can get her at 5:30 pm today, so we will be leaving for Columbus soon. The cancer has not spread beyond the jaw, so Bally is a candidate for surgery. If we agree, after consulting with the vet oncologist when we arrive in Columbus, the surgery will be performed later this week. We were told one of the risk factors is that the nerves in the tongue can be damaged during the procedure. If this occurs, Bally would be unable to use her tongue - and would not be able to eat without a feeding tube, which is something that would affect her quality of life. I will know more after the consultation. Over one hurdle and onto the next. 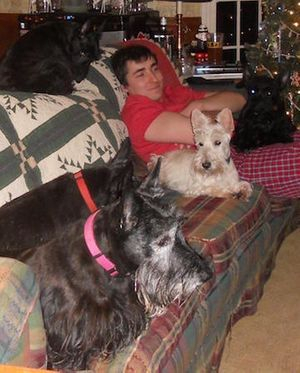 Christmas 2010 - Our five Scotties on the sofa. Bally is the one sleeping on the back of the sofa. JUNE 15 ~ My son and I arrived home from the the clinic at OSU in Columbus late last night. It was another long day. I spoke with the vets who are handling the case and a surgeon. They said surgery was an option, but they would have to remove Bally's entire lower jaw due to the extent of the cancer which has caused the jaw to break. The known risks are they may cut into an artery and Bally will bleed out on the operating table. Another risk is that they might cut nerves in her tongue and she would have to spend the rest of her life with a feeding tube. If the surgery went as planned, Bally would be home a few days post-op, she would have a feeding tube for two to three weeks while she healed and learned to eat without a lower jaw, and she would eventually return to a "normal" life although not a pretty as she was before the surgery. They did not discuss long term survival rates. I have a difficult decision to make, but I want to do some research online. Bally is doing great. She is interested in everything, active, and eating, but I don't know how long she will stay this way. She has gained two pounds since she was seen by the vet May 19. As soon as we arrived home, she wanted to go for a walk. We also went on a walk this morning. Bally walks briskly, tries to chase squirrels, and greets every passerby we meet. She enjoyed being reunited with her dog siblings last night and this morning she wanted to visit her cat siblings. The vets at the clinic said she is a sweetheart and a fighter. At this point the easy decision would be to euthanize Bally like the vet suggested June 2. I wouldn't have to worry about her condition, her pain, her prognosis, her quality of life, the expense of treatment, the trips back and forth to the vet clinic, and the hours sitting at the clinic waiting for some sort of news. I have had several people who have gone through similar situations tell me that killing her, and yes, she would die and not just go to sleep, is more humane, more unselfish, and the best choice if my goal is to maintain a good quality of life for Bally. I have also heard from others, whose dogs are one, two, and three years post-op, who say their dogs are enjoying a good quality of life without a lower jaw, even though this prospect is horrifying to me. I know there is no "right" decision. Every situation is unique. If Bally were older and/or a dog with a different personality, my thought processes would probably be different. I know dogs live in the moment and have no notion of mortality. I also know that at this moment in time, Bally is not ready to give up and leave her family. I just spoke with the veterinary oncologist and surgery is scheduled for Friday. Bally has to be at the vet clinic at 5:00pm Thursday. I was told that there is no other option than surgery and that if I decide to cancel the procedure, Bally's condition will quickly decline. Even with surgery, Bally's prognosis is uncertain. JUNE 16 ~ MAKING A DECISION ~ I have decided to go ahead with surgery since there are only two options - surgery or euthanizing Ballantine - and I feel like Bally is not ready to give up...so I will not give up on her. My son and I made our third trip to Columbus in one week. Bally sat on my lap while we waited for someone to come get her. Bally's mouth was bloody and swollen and some of her teeth were missing. Bally hadn't eaten as much that morning and she seemed not as engaged as she usually is, but she still showed an interest in a puppy who was yapping behind us. She had to get on the floor and peer under the chair to get a better look at him. The vet intern who came to get Ballantine asked some basic questions and assured me that they would take care of Bally. He said Bally was the star of the medical clinic and that everyone knew who she was. I gave Bally one last hug before leaving her. I keep wavering in my decision. I don't know if I can let the vets mutilate Bally's sweet face. And then I think...she is still so active and interested in life. She is eating, going for walks, acting as if everything is normal...How can I not give her a chance? I guess it all comes down to quality of life and that is the big if. I can almost accept her dying on the table during surgery, but having her come out of the surgery disfigured and finding out her tongue is paralyzed or having the cancer come back within a short period of time and putting her through all this for nothing is my worst nightmare. I keep asking my husband and children to help me make the decision, but they are putting the whole burden on me. No matter what I decide, I will have regrets. Bally, the night before her surgery, barking at lightning and thunder. JUNE 17 ~ SURGERY DAY: 11:30am - I just heard from the vet intern at OSU - Bally hasn't even be taken to surgery yet! They have many surgeries scheduled today. Bally was given a pain pill this morning and will be given anesthesia soon. I have been sick with worry all morning. Of course, I have been second guessing myself. Is it right to have them mutilate her and cause her more stress and pain even if it might save or extend her life? When I left Bally at the clinic last night, the vet oncologist told me Bally's fate was now out of my hands, but that is small comfort because I was the one who made this decision for her. 4:20pm: It has been a long, stressful day, but Bally made it through the first hurdle. The vet intern just called and said Ballantine survived the surgery. She was just waking up and has an IV and a feeding tube. They will give her pain medication as needed and they are waiting for the pathology report. 5:45pm: Bally's surgeon just called. He said they were very happy with the way surgery went. The big concern at the moment is that her feeding tube will work. He said they were able to save many of the tongue muscles and, hopefully, she will be able to eat on her own after she heals. I hope he is right. They will call be tomorrow with another update. JUNE 18 ~ ONE DAY POST OP - 11:00am: Bally's vet oncologist called with a morning update. She said Bally is resting comfortably one day post-op and any pain she might be experiencing is being well managed. They tried to hand feed Bally (even though she has a feeding tube) and Bally moved her tongue to take the food, which the vet said was amazing and an indication that Bally will be able to eat instead of being burdened with a permanent feeding tube (which is something I said I would not allow Bally to suffer). The pathology report will not be available for five to seven days, so as of yet we do not have a long term prognosis or course of treatment. We will take this one step at a time. The vet also commented that Bally is an amazing little dog and is doing much better than expected. I knew Bally was a fighter. 5:30pm: Evening report on Bally. She is still doing well. They are managing her pain well, keeping the level below one in a range of one to ten. She went for a short walk and when someone approaches her cage, she comes forward to be petted. They asked if I wanted to see photos of how she looks, but I don't think I am quite ready for that. JUNE 19 ~ TWO DAYS POST-OP - I was told Bally is doing well. They are going to wean her from her IV today and try to feed her and give medication through her feeding tube. I was told Bally may be able to come home as soon as Tuesday if all goes well. I am happy, but apprehensive since we live so far from the clinic if an emergency arises. I am looking forward to having my little girl home again, but I am afraid of my reaction to her new face. I know it will be the same Bally on the inside even if the outside is different, but I will feel guilty about the terrible choice I had to make. Bally recuperating at home one week post-op in one of her favorite spots - on the back of the sofa. JUNE 22 ~ BALLANTINE IS HOME!! My husband, Bally, and I didn't get home until after 11:00 pm. It was a long, stressful day with a very happy ending! My husband and I drove to Columbus yesterday to bring Bally home. Due to road construction, heavy rainstorms, and a problem on the bridge from Kentucky to Ohio, a one-way three hour drive took over five hours. The surgeon met with us before we saw Bally and explained Bally's post-op care. Bally has a temporary feeding tube which will be removed in 10 days during her follow-up visit to the clinic. We feed her and give her medication via the tube three times/day. If the tube kinks, we were told to take Bally to a local vet and have it removed because she is capable of eating on her own. However, they would like to keep the tube in place as long as possible, so Bally's sutures will heal. The surgeon said everyone is VERY pleased with the outcome of the surgery, considering the risks that were involved and the extent of damage to Bally's jaw. He commented that every time he saw Bally post-op she looked better and better and that I would be surprised at how good she looks. The surgeon said Bally's case will probably be written up in a paper or journal because she has had the most extensive jaw surgery of any dog with this type of jaw cancer. The pathology report won't be back until this Friday, so until then they do not know if Bally will need follow-up treatment or her long term prognosis. So how does Bally look? From the front view she looks pretty much like Ballantine with no beard (because they had to shave it for the surgery) and a tongue that hangs down. 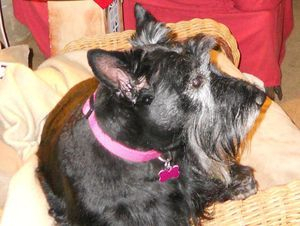 Bally has a very small head for a Scottish Terrier and with her beard missing, she looks almost ferret-like. We were assured her appearance would look more "normal" once her beard grows in. From the side view Bally?s face looks even more narrow due to the lack of a lower jaw. During the procedure they created a pouch out of skin to hold up Bally's tongue somewhat. I thought she would look ugly/scary, but my son thinks she looks "funny", more like a cartoon character than a monster. As for Bally... she is still Bally. As soon as she saw us, she tried to kiss us with what now seems like a very long tongue. When the surgeon showed my husband how to feed Bally her diet of high caloric canned dog food mixed with water through the feeding tube, some of the food fell on the floor and Bally licked it up. She can go for walks, but she will need a harness instead of a collar so as not to irritate her incision. When we brought Bally home, we kept her separated from our other dogs, so they wouldn't bother her or injure her mouth area, but they all greeted her through a gate placed between the kitchen and other areas of the house. My husband let her walk around the backyard for a short period of time after the long drive. Bally sat with us on the sofa for the rest of the evening. She does not seem to be in any pain. She is still receiving pain medication, but we were told we can start weaning her from the medication. My husband fed Bally before he went to work this morning and she has been wandering around the house. She tried to visit our cats, which are also being kept separate, but I thought that reunion will have to wait. I am probably being over-cautious, but I want Bally's post-op recovery to go forward without any problems or setbacks. Bally acts as if everything is "normal" and she has no limitations. I must have left the gate to the kitchen unlatched while I was eating breakfast and Bally came in, immediately took a long drink of water from the water bowl (splashing water everywhere), and sat down next to her fur siblings who showed a great interest in having her home. It is going to be difficult for me to treat Bally like a "normal" dog. Bally is currently laying at my feet sleeping. I don't know what the future will bring, but at the moment Bally seems to be doing much better than I expected...and in such a short period of time. One week ago she was dying, but today, as someone pointed out to me, Bally is living with cancer. Thanks to everyone who gave me advice and emotional support during a very difficult time and helped me make the right decision for Ballantine. Side view of Bally with her lower jaw removed and still swollen from surgery. JUNE 24 ~ Bally is doing well. Yesterday and today we spent time in the backyard with Bally's fur siblings and she seemed to enjoy feeding the fish, sitting in my lap and on the grass, and wandering around the yard. Last night she showed some of the "old" Bally traits - keeping an eye on our other female whom she likes to control. We can't even say Ohno's name out loud when Bally is around because she runs over to Ohno and gives her the evil eye. Anytime Bally acts a little "different" I get worried, but I realize she and I can't live like that, so I am trying to be positive. JUNE 25 ~ Last night Bally tried to play with one of her toys. It was sad to see her try since she can't pick up toys any more. 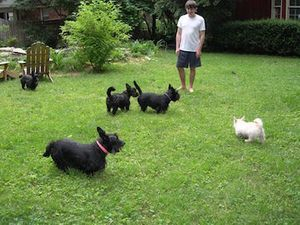 Years ago we had a Scottie who would push a soccer ball around the yard for hours. Maybe we can find new ways for Bally to have fun. This morning Bally rolled over for me to rub her tummy - something she hasn't done in a very long time. JUNE 27 ~ Bally becomes more like her old self every day. Today she sat on the picnic table so she could have a better view of her domain. She dislikes her feeding tube and tries to get at it with her paws. She drinks water on her own and has enjoyed being separated from her buddies. Bally is doing extremely well considering she has no lower jaw. We haven't heard from the oncologist about the pathology report, but we go back to the clinic on Thursday to have Bally's sutures and feeding tube removed, so I guess at that time we will be informed about Bally's prognosis and if more treatment is needed. JUNE 28 ~ Bally went for a "real" walk today. We bought her a harness to replace her collar and a new bright pink leash. She was happy to be outside and walked at a brisk pace...much different than the pre-surgery Bally. When we went outside to feed the fish, Bally decided to dig in the dirt. Her nose, tongue and feet were coated with dirt and we had to wash her before she could have lunch via her feeding tube. JUNE 29 ~ Bally is wagging her tail more each day. Hopefully, a sign of a happy dog. This morning she barked for the first time. The other dogs ran outside to howl at a siren...quite a sight to see and hear - a pack of Scottish Terriers howling like Beagles...and Bally joined in with several short barks. She always had a high, short bark and it was wonderful to hear. 13 days post-op. Going for a walk before returning to OSU to have sutures and feeding tube removed. JUNE 30 ~ Driving to Columbus to have Bally's sutures and feeding tube removed and to find out results of pathology report and prognosis. JULY 1 ~ TEST RESULT AND PROGNOSIS - The new Bally is starting to look not so strange to me. I know others do a double take when they see her, but she is still my Bally girl. Her lower jaw is gone, her upper beard has been shaved (but growing! ), her front legs are hairless where they shaved them for the IV, and her fur is crazy (as it always was - growing every which way and curly). My husband had to bathe Bally Wednesday night because she had dirt on her face, paws and tongue from digging in the dirt Wednesday and she needs a good brushing. My husband thinks Bally looks like one of the wild dogs/creatures from the movie "Willow". Prognosis: Ballantine's tumor was completely excised. The reported local metastasis rate is 20% Chemotherapy (the usual recommended course of follow-up treatment) was not recommended at this time due to the fact that the metastasis rate is relatively low and complications of chemotherapy exceed the risk of metastasis. Ballantine has to return for follow up in six weeks and every two months thereafter for six months. Surgical incision appears to be healed. Ballantine is able to move her tongue and is in good spirits. Next hurdle: Keeping Bally well fed and healthy. Bally many now begin to eat with her mouth. She will require soft foods. Ballantine may have difficulties at first, so it will be necessary to experiment with a variety of foods. We have to weigh her every few days to ensure that she is eating enough and not losing weight. Bally at meal time. A very messy process until we bought her a large bib with a pocket to catch drips and spatters. JULY 5 ~ Ballantine is doing well. She has to relearn how to eat since she no longer has a lower jaw. We have been trying different foods ground up and moistened. Over the past four days the process has been getting easier. We hope that the day will come when Bally will be able to eat softened kibble on her own. JULY 10 ~ Bally is now two and a half weeks post-op and she is doing well. She looks different without a lower jaw, but her spirits are good. She goes for walks, digs in the dirt in the backyard, naps on the sofa, and enjoys being with all of her fur siblings. 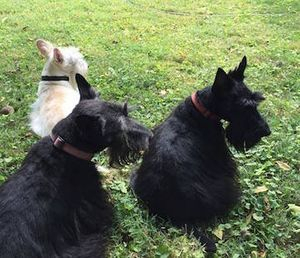 Bally has even reclaimed her role as the alpha female in our herd of five Scottish Terriers. We do have our sad moments. Bally tries to play with her toys, which she can no longer pick up, and her efforts to catch flies are futile. Bally's feeding tube was removed just over one week ago, so her biggest challenge at the moment is learning how to eat again. Bally has to eat foods that have been liquefied which she can lap up. Sometimes it takes her 30 minutes to eat one bowl of food and the great effort it takes her to do this makes me want to cry. I realize that there will be a learning curve for Bally and me. Our long term goal is to get Bally to the point where she can eat soft foods on her own. One thing that I have learned from this terrible experience, other than the fact that there are many good people out there, is that animals live in the moment. While Bally's prognosis is good, there is a chance that the cancer will return or appear in another location. I have been trying to enjoy each day I have with Bally and focus on the things she is able to do and enjoy rather than focusing on a future over which I have no control. JULY 30 ~ Bally is doing very well. She has gained weight and is my Bally girl again in every sense except for her looks. Yesterday morning she woke me up trying to jump onto my bed, which is VERY high off the ground, and when I asked her if she wanted to go outside, she made me chase her around the dining room table. She loves to visit her kitty friends, goes outside on the last run of the night (something she stopped doing two months ago...which was one of the reasons why I knew something was wrong with her), and sleeps with her fur siblings at night. She tries to catch flies and if there is a "dispute" she is right in the middle of everything, giving everyone the evil eye and showing that she has resumed her role as the alpha female. She hasn't learned to eat soft foods yet, but she is getting much better at eating her liquid diet - faster and neater. Today I sat outside by our fish pond and Bally climbed on my lap. The last time she did that was the day we drove her to Columbus for her surgery. We will be returning to OSU on August 11th for Bally's six week follow up visit. Macallan sleeping close to Ballantine. Bally is wearing her new pink harness since she can no longer wear a collar. AUGUST 11 ~ SIX WEEK POST-OP CHECKUP: Today my husband and I drove to the Veterinary Medical Center at OSU for Ballantine's six week post-op visit. I had a sleepless night. I went to bed late and woke up at 4:00am afraid of the possible outcome of the visit and worried that we might oversleep and miss the appointment which was scheduled for 10:30am. When we arrived at the clinic we checked in at the desk and sat in the large waiting room. An older couple was seated across from us. They kept looking at Bally. After several minutes the woman asked if Bally had her lower jaw removed due to jaw cancer. When I replied "Yes," the woman commented that their 15 year old dog was diagnosed with jaw cancer and had died two months post-up...Not the kind of thing I wanted to hear. Shortly thereafter the veterinary intern assigned to Bally's case called us back to an examination room and proceeded to tell us that it had been a bad morning. She had to tell three previous people who were there for appointments that the news was not good. That was when my stomach began to churn and my thoughts ran wild. In the examining room we discussed the progress Bally had made over the past six weeks. She has a good appetite, her coat is shiny, her eyes are clear, she appears to have gained weight, and her personality has returned. When a very large playful Labrador Retriever sniffed at her too long in the waiting room, Bally responded with a growl and a defensive stance. Bally was subsequently taken to the back area to be examined. While we were waiting, my husband and I walked over to the nearby medical school building to get coffee at Starbucks. My husband started taking with a man behind us. The man asked why we at the school. 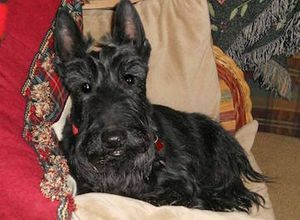 When we said our dog was being examined at the clinic after undergoing jaw surgery six weeks ago, the man asked if our dog was Ballantine the Scottie. We discovered that he was one of the surgeons who had assisted in Bally's surgery. Two hours later we met with one of Bally's oncologists. All of the news was good. Everyone was pleased with the results. Bally appeared to be in excellent health, the X-rays were clear, and her weight was the same as it was the day after surgery...at which time she may have been bloated with fluids. The vet noted that Bally's tongue had grown much stronger and this trend would probably continue. We were told to keep giving Bally the good care she was receiving at home and to return in two to three months for another examination. We asked about trying to teach Bally to eat something other than liquefied food and it was suggested we make tiny meatballs for her to try to lap up. Three or four people spoke with us during the visit. The oncologist said Bally was one of the stars at the clinic and that staff and doctors had come to see her when they heard she was back for a followup visit. We were told Bally had the most extensive jaw surgery that any dog had ever undergone at the clinic and they were amazed at her progress. We had been warned that post-op she might drool excessively, have an offensive odor, and/or her tongue would constantly hang from her mouth. Bally rarely drools, she smells no worse (and no better!) than our other dogs, and she has learned to keep her tongue pulled back so that it isn?t constantly fully extended. She has learned to roll her tongue up like a cat instead of down like a dog when she eats and her feeding time has shortened to 15 to 20 minutes three times a day instead of 45 minutes for each meal. Bally's upper beard has started to grow back in so her thin face doesn't look so ferret-like. During the visit Bally was interested in everything around her, wagged her tail, greeted everyone, and appeared to be the Bally I remember before she got sick. SEPTEMBER 3 ~ THREE MONTHS POST-DIAGNOSIS - Bally becomes more like her old self every day. In the morning she gets up on her back legs seeking a pat on the head and eagerly comes when told it is time for a meal. Two days ago she started to participate in one of her favorite games with the other dogs, run and chase. 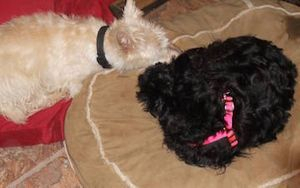 She and Macallan barked at each other, trying to get the other to begin their mad pursuit around the furniture with the winner leaping onto the sofa to declare themselves king or queen. The only sad moment was when Macallan squeaked one of their toys hoping to get Bally to engage in a game of tug of war and Bally was unable to grab her end of the stuffed dog. I probably felt the loss more than Bally, who simply walked away. Last night Bally jumped on the back of the sofa and tried to give kisses to one of my son's friends...the price you must pay to sit on the sofa. Bally's appetite increases every day, but she still isn't able to eat anything that isn't liquefied. NOVEMBER 11 ~ FIVE MONTHS POST-OP - Yesterday my husband and I drove to the veterinary clinic at Ohio State University for Ballantine's three month checkup. She was diagnosed with cancer of the lower jaw on June 4th, 2011 and underwent surgery on June 14th, so she is approximately five months post-op. The three months since Bally's last checkup have flown by and each day has been better than the previous one. Except for her obvious lack of a lower jaw, Bally is 100% the pre-surgery Ballantine. She enthusiastically consumes her meals three times/day with the assistance of my husband (they have their own mealtime ritual) and she pushes the bowl away with her nose when she has had enough. Now that the weather has turned cooler Bally enjoys sitting on the table on the patio where, as the resident lioness/alpha female, she surveys her domain. While we watch our favorite TV shows and movies each evening, Bally initiates "run and chase" - one of her favorite games - with Macallan. When the game is over, Bally takes her position on the sofa snuggled up close to me while her brother Pinch, the resident lap dog, sits on my lap. Every day has been good. The drive to Columbus was uneventful except for the usual delays caused by rush hour traffic and road construction. Based on Bally's recent appetite, physical appearance, and energy level I had no apprehensions about the upcoming examination. We arrived at the clinic on time for our 10:30am appointment. As we sat in the large waiting area waiting for our name to be called, I was reminded of why we were there. The room was filled with dogs (I saw no cats) with a variety of health issues/conditions. The most obvious (and most disconcerting) were the Greyhound with three legs, the Rottweiler mix whose breathing was loud and ragged, the Newfoundland with weakened back legs who was carried out with the assistance of two people holding his back legs up with a sling, and a beautiful Chocolate Lab mix who had a very large growth protruding from his right side near his rib cage. I was shocked back into reality....Bally is a cancer patient. When our name was called, we were escorted into a private room where we gave a short history of the past three months to a veterinary student. We were told that the examination and X-rays would probably take two hours because the radiation department was backed-up with other patients. My husband and I went out for lunch and then returned, fully anticipating that Ballantine would be given a clean bill of heath. The oncologist began with the good news. Bally’s chest X-rays were clear with no signs of cancer. Bally had gained a pound since her last visit and her physical appearance and feistiness indicated she was feeling well. The bad news was that all of Ballantine's lymph nodes were enlarged. She had a small area on her back that appeared to be some sort of skin irritation or infection. A lymph node in her neck area was aspirated. We were told Bally wasn't very pleased and tried to "bite" the oncologist during the procedure. Preliminary tests showed no cancer cells were present. Ballantine was prescribed an antibiotic and we have an appointment to return to the clinic in two weeks (the day before Thanksgiving Day) for a recheck. I asked if I should be worried/overly concerned/prepared for the worst, but the oncologist stated that if Ballantine had not been a cancer patient and had presented to the clinic for an annual examination, her enlarged lymph glands would probably have been overlooked or would have been of little or no concern. The fact that Bally IS a cancer patient requires that every abnormality must be closely watched and evaluated. I am trying to stay optimistic, but that is difficult to do. Bally has been through so much, has lost so much...and has proven that she is a fighter who loves life. Before Bally was diagnosed with cancer I had a "gut" feeling that something was wrong because she was acting differently, but this time I saw no signs and heard no little voice in my head telling me something might be wrong. While feeding Bally this morning my husband mentioned that for the past few days Bally hasn't been eating as much of her meals as she previously had. He wasn't concerned since she is still eating with gusto and she has gained weight. We were warned that the medication Bally was prescribed has a bitter taste and may cause stomach upsets. Bally is no fool. She ate a large portion of her breakfast this morning, but wouldn't touch the small bowl of food that contained the medication. The solution was to mix the two together, but we did so reluctantly because we don't want her to stop eating. I know I will be watching Bally more closely, keeping her closer, and holding my breath for the next two weeks. Please keep Bally in your thoughts and prayers. I am hoping this is merely a small bump in the road of this very difficult journey. Bally going on a walk before we head off to Columbus for one of her visits at OSU Veterinary Clinic. FEBRUARY 23, 2012 ~ EIGHT MONTHS POST-OP CHECKUP: The news today was not good. Bally's cancer has returned. One of her lymph nodes was enlarged and cancer cells were observed when the lymph node was aspirated. Fortunately, if there is any fortune to be had in this situation, X-rays showed Bally's lungs were clear. Bally will have a CT-scan tomorrow morning to determine if the cancer has spread to other lymph nodes and, if possible, she will undergo surgery tomorrow afternoon. I will write more after I have spoken with the oncologist again. My husband and I left Bally at the clinic with a bowl of her food and, hopefully, in good hands. It will not be an easy night for us. I am so sad. I have many things to post, but at the moment I can't focus on anything except Bally and her siblings at home who will be without their sister tonight. Bally has endured so much. Please send good thoughts her way. FEBRUARY 24 ~ BALLY'S SECOND SURGERY: Today was an excruciatingly long day. Every moment I kept imagining what must be happening to Bally. Surgery was scheduled at 1:00pm and I kept imagining the worst, but tried hoping for the best. After hours of stress, we finally received a call from the clinic. Bally?s surgery went well. She is awake and alert. The surgeon removed the cancerous lymph node plus two others that looked "iffy." All were sent to pathology. We have to pick up Bally by 9:30am tomorrow, so it will be another early road trip to Columbus. We were told Bally has to return to the clinic in two weeks. We will know more after we speak with Bally's oncologist. APRIL 24 ~ BALLY'S 7th BIRTHDAY: Today is Bally's (and her brother Pinch's) 7th birthday...a day I thought we would not be able to celebrate when Bally was diagnosed with cancer of the lower jaw ten months ago. Bally had a good check-up yesterday. She appears to be cancer free at the moment, although an enlarged salivary gland caused some concern. Bally is tolerating the chemotherapy well and the only side affect has been short term loss of appetite which has caused Bally to lose some weight on her already thin frame. Our main focus is keeping Bally healthy, happy, and increasing her weight. MAY 15th ~ Fourth Round of Chemotherapy: Yesterday was a long day, but Bally's most recent visit to the Ohio State Veterinary Clinic went well. Bally has gained one pound and she was given a clean bill of health. We have to return to the clinic in three weeks for a new round of chemotherapy. This one will add a new drug that has shown promise in treating, and hopefully, destroying, Bally's type of cancer. I asked about the success rate of this new treatment. I was told that in dogs with large observable tumors the new drug has had some success in shrinking the tumors. Since Bally never had visible tumors, it is hoped the drug will attack any cancer cells that were not destroyed by the previous treatments. The new treatment does not come with a guarantee, but at least it gives me some hope that we are doing everything we can for Bally. I also asked about some skin issues Bally was having...small bumps on her chest and shoulder and some hair loss on her chest. Scotties are notorious for having skin issues. I was assured the skin problem was not cancer-related and that the dermatologists at the clinic could examine Bally and perform tests. However, the cost for the work-up was an additional $200...which is an expense we can't afford at the moment considering the high cost of Bally's current course of treatment. I felt guilty having to make that decision, but we have had to make some difficult choices over the past year since our resources are limited and we have other dogs, cats, and human family members who also need medical care. As for Bally, she looks and behaves as if she doesn't have cancer. She is affectionate, playful, curious, active, and has a good appetite. 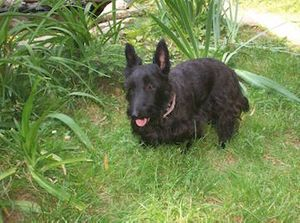 Her body has filled out and she was recently groomed, so except for her normally small head and her missing lower jaw, she looks and acts like a healthy Scottie should behave. JUNE 18 ~ Another road trip to Columbus: Today was Ballantine's two week followup check-up at the veterinary clinic at OSU. The results of today's tests were good. Bally has not had any adverse reaction to taking Palladia, a chemotherapy drug in pill form for dogs that can have many side effects. Bally's blood work was good and physically she appears to be well. She continues to be playful and active...with a good appetite. She has been maintaining a good weight. Bally's regular oncologist was off this week, but the oncologist in training and the veterinary intern told me Bally is progressing as they had hoped. Everyone at the clinic knows who Bally is and she has become one of their "star" patients. Bally will have to remain on Palladia as long as it keeps her cancer at bay. We have to return to the clinic in one month for another check-up and X-rays. The Palladia appears to have had no negative effects upon Bally and at the moment she is as healthy and active as she was before she showed signs of illness over 13 months ago. During our previous visit to the clinic two weeks ago, Bally's oncologist commented that "Bally has taken us places we didn't think we could go. "Not only is Bally alive today with a good quality of life, but hopefully this journey we have been taking will help other dogs who are diagnosed with this terrible disease. JUNE 22 ~ Yesterday Bally gave us a scare. It had nothing to do with her cancer, but was actually caused by how well she is doing. The healthy Bally was and is very determined. She will spend hours running around the backyard chasing some little critter (real or imagined), hunting down a fly in the house, or maintaining control of our pack as the alpha female. Today the temperature reached 92 degrees. Our dogs have access to the backyard via a dog door. Unbeknownst to me, Bally spent several hours outside trying to track down a critter in the yard. She could have come in to cool off or to get a drink of water at any time, but her determination overcame her dog sense. When my husband came home for lunch and to feed Bally, he discovered Bally in the yard, still in pursuit, panting heavily. It took her about 30 minutes to settle down and cool off. 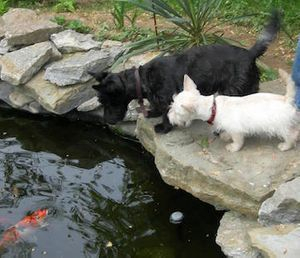 On hot days the dogs rarely go outside unless it is to help feed the fish or follow me as I weed and prune. I will have to be more vigilant in keep tabs on the dogs, especially Bally, now that hot weather is upon us. 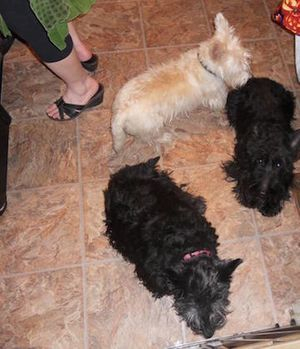 Halloween party and three of our scruffy pups are staying close by in case something good falls on the floor. Bally is on the right in the photo. UPDATE (8:40am) Yesterday was a long day. I went to my mother-in-law's house and performed yard work for several hours to avoid thinking about Ballantine undergoing surgery. Digging in the dirt has always been a great stress reliever for me. When my husband came to pick me up at 5:00pm neither of us had yet received a call from the clinic with an update. My husband had called the clinic at 4:30pm and left a message. After 6:00pm we finally received a call. Ballantine's surgery had been scheduled for late in the day and she was in the recovery room resting. As far as they could tell, the entire mass in her salivary gland had been removed and all looked well. Unfortunately with cancer, it is impossible to get every cell. We were told that they would try to feed Bally and take her for a walk later in the evening. We would also receive an update this morning after 7:30 rounds. As of yet, we have received no news and, as the minutes tick by, my anxiety grows. UPDATE (10:00am) Just heard from the clinic. Bally rested well last night and ate this morning as well as last night. That, at least, is good news since it indicates the nerve that controls her tongue was not damaged during the surgery. Any pain she is experiencing is being controlled with medication. We are driving to Columbus this afternoon to bring her home. At that time Bally's oncologist will give us more information about the outcome of the surgery. At this point all I want to do is to bring Bally home. When she is away there is a void in our muttley crew. Even though we have five dogs, when one is missing for whatever reason, the absence is felt by all and has a great impact. Since Bally is our alpha female, there is a temporary shift in the pecking order. Poor Ohno, who is our 12 year old female and twice Bally's size, is dominated by Bally when she is here. She can't make a move without Bally giving her the evil eye. Last night Ohno sat on the sofa next to me and "spoke", demanding attention. This was a rare opportunity for Ohno since Bally usually spends most evenings sleeping by my side. SEPTEMBER 22 ~ POST OP VISIT: We received GOOD news today. Whatever was going on with Bally's salivary gland was NOT cancer. Bally's oncologist said the salivary gland just went "wonky". I can't express the relief I feel. Bally does has a small cancerous nodule on her lung, but it has not increased in size. I can breath for another month. OCTOBER 24 ~ Yesterday Bally had her monthly visit to the OSU Clinic. She had a great check-up. While we were in the waiting room, Bally tried to attack a dog walking in front of us for who knows whatever reason. Luckily, I was holding her and grabbed her before she jumped from my lap. Someone from the clinic came up to us and said that when they first saw Bally they felt sorry for her until they realized that she can bark, growl and hold her own. The surgeon who performed Bally's first surgery came in to take a video of Bally. She is the star of the clinic. They said she is fierce and spunky. Bally goes back for another checkup and X-rays Thanksgiving week. 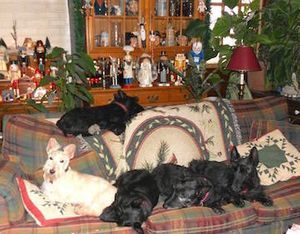 Five Scottish Terriers - Ohno, Walker, Macallan and PInch plus Ballantine on the back of the sofa. NOVEMBER 20 ~ VISIT TO CLINIC: The news we received yesterday about Bally was not what I had hoped and expected. She has been doing so well. The node on her lung previously seen on two X-rays has disappeared, but another one has appeared in a different location in her lung. Without further tests they don't know if it is a malignant tumor an aberration like the growth on her salivary gland that was removed. The oncologist had several recommendations: 1. We wait a month and perform another X-ray to see if the growth has changed; 2. They perform a CT-scan which will give them a better look at what is going on; or 3. We do nothing and hope for the best. If the growth is malignant and spreading there are still options - possible removal of the growth if it is contained or another round of chemotherapy using human chemotherapy drugs if it is not. The oncologist recommended the CT-scan and a biopsy of the growth if that is possible, which would have its own risks since Bally would have to be put under anesthesia and there is a possibility that her lung could collapse if the site of the biopsy doesn't self seal. We have a CT-scan scheduled for next Tuesday. I still want to research online until I feel that I am making the right decision for Bally. A quick search online leads me to believe their is still hope. I am so tired of making decisions that I don't want to make, but we have so much invested in Bally (and I am not talking about money) that I can't and won't give up on her until she tells me that she has had enough. Bally has been with us seventeen months longer than the "no hope" prognosis we were given the day she was diagnosed with cancer. We were told that in dealing with cancer in dogs, the goal is adding months and not years. I am greedy. I want one more day...and then another. NOVEMBER 26 ~ Tomorrow we drive to Columbus for Bally's CT-scan...which I have been dreading. Bally seems better than ever. Her appetite has increased and she has visibly gained weight. She is active, loving, and still is the alpha female. Every evening she goes out in the backyard and hunts for little critters. Her nose is constantly dirty. The thought of putting her under anesthesia and performing a lung biopsy is killing me. NOVEMBER 27 ~ CT-Scan: The news today was good/bad (according to the oncologist) depending on whether you are a glass-half-full or glass-half-empty kind of person. I am trying to be a glass-half-full person. The C-T scan gave a clearer picture of Bally's lungs. There are what appears to be a few small tumors in the lungs (one centimeter size), but they appear to be eroding. The oncologist didn't know how to explain it because what they saw was not typical. He described the tumors as a circle with the center gone. It appears that the Palladia Bally has been taking is doing its work. The tumor which was visible on two previous X-rays (one taken many months ago) is gone. They attempted to aspirate samples from the tumors five times, but all attempts were unsuccessful due to the size, condition, and location of the growths. They haven't ruled out an infection or parasite instead of cancer, but since they can't get a sample?and given Bally's history of cancer, they assume the tumors are related to the jaw cancer. We were instructed to continue giving Bally Palladia (dogs in the original test 10 years ago were able to take it for years) and return in three weeks for another X-ray. I was hoping we wouldn't have to return until after the holidays, but at this point I am not going to second guess or question anything. Bally was diagnosed with terminal cancer 18 months ago yesterday and every day is a gift. 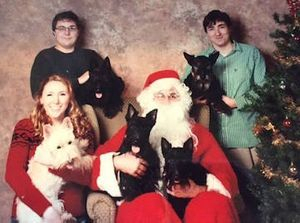 One of my favorite Christmas photos from happier days...Walker (upper left), Ohno (upper right), Macallan (lower left, Pinch (lower middle), and Bally (lower right). DECEMBER 18 ~ Follow-Up X-ray: The news yesterday was good if you are a glass-half-full person. The growths in Bally's lungs have remained stable. The X-ray showed that the tumors may have grown a little, but we were told by two different people that this might be the result of the X-rays being taken at a slightly different angle than previous ones. Unlike the CT-scan, the X-rays don't give a clear picture of what is going on. The best news was they discovered no new growths, which indicates Bally's disease is stable. The attempts to take a biopsy three weeks ago resulted in a finding of no cancerous cells. JANUARY 14, 2013 ~ Monthly Checkup at OSU: Bally received a good report. All bloodwork was in the normal range and Bally's lungs were clear. Bally looks and acts better than I have seen her since she was first diagnosed with cancer 19 months ago. Ballantine in 2006 before we adopted Walker and Ohno. She had just turned one and, as the alpha female, kept watch over everyone and everything. 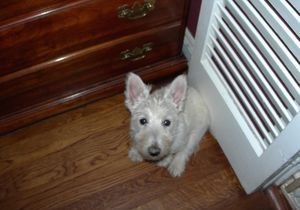 JANUARY 29 ~ An Unexpected Setback: Last Wednesday I noticed that Bally was breathing differently. I voiced my observations to my husband and, as usual, he dismissed my concerns. That night I had a dream that Bally wasn't breathing right. When my husband fed Bally the following morning, he noticed she was a little "raspy" and she wasn't eating with as much gusto as usual. We called the clinic at OSU. Bally's oncologist was not in, but the oncologist on call told us to monitor Bally's respirations. We did and they were within the normal range. As the days passed I took Bally for a daily walk and, except for my concerns about her breathing (which seemed to get better) and her disinterest in eating, she was as active and energetic as usual. When we went on our walks, she literally dragged me down the street, was alert, and tried to chase passing vehicles. Monday morning the oncologist called to check up on Bally and when we described what was happening, she suggested that we bring Bally in Monday or Tuesday. My husband and I immediately left for Columbus. At the clinic we were told that they were going to perform blood work and take an X-ray, so we had time to go out for lunch or see a movie. They also told us to wait until the oncologist could speak with us before we left the premises. When the oncologist comes out to speak with us, it is always bad news. Bally had a collapsed lung. One of the tumors had made a tiny hole in the wall of her lung and fluid was leaking into the lung, causing it to collapse. We were told this is a very rare occurrence. The oncologist was amazed that Bally had been going for walks, walked into the clinic, and was walking in the back hallways, curious and full of energy. She was probably not eating as much because it was difficult for her to breath while she was eating. The oncologist commented that Bally must not have seen her X-ray since she was acting so "normal". We were given several options, including euthanizing Bally immediately...which for us was not an option since Bally is still full of life and not in pain. They told us they would try to inflate the lung and they could possibly perform surgery to seal the hole, which was not without risks. A CT-scan showed Bally's lung tumors had grown slightly, but were not yet at a "fatal" stage. We weighed our options and decided to go ahead with the surgery, which will be performed this morning. While we were driving back to Louisville, we received a call informing us that Bally's lung had been inflated. She was awake from anesthesia and looking around at everything. The oncologist said she would give Bally a kiss for me. We just received a call that Bally rested well last night and she has been sedated in preparation for her surgery. Bally's surgery is the first one on the schedule this morning. If all goes well, Bally will stay at the clinic for two or three days. We will discuss if there are any options going forward when we drive to Columbus to bring Bally home. At this point all I can do is wait. What happens next is not in my hands. Every decision my husband and I have made has been with Bally's best interests in mind. Our primary goal has been to give Bally every chance possible as long as she has a good quality of life with no pain. Today I will be good for nothing. Update: Noon - Bally survived the surgery and is in ICU. They decided to remove the entire left lung and told us that the right lung will compensate for the missing lung. Of course, if the right lung collapses, Bally will die immediately. If she gets pneumonia, she will die. If the Palladia stops working, she will die. With cancer and its various complications, all roads ultimately lead to one destination. I am trying to stay focused on the positive and remind myself of the commercial where a terminal cancer patient seeking treatment is told by her oncologist: "You have no expiration date. That is in hands way above mine." Update: Evening - Bally is resting comfortably at the OSU Clinic and is said to be doing well. Her temperature is slightly elevated, which can be due to her cancer or the recent surgery. They are administering Rimadyl, a non-steroidal, anti-inflammatory drug for managing pain in dogs, to help combat any infection. She is also receiving fluids and other pain medication. 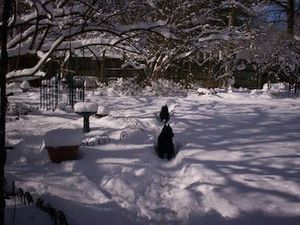 Bally and Walker exploring the backyard during happier days in 2007. February 1st - One Day Post-Op: The veterinary assistant in charge of Bally's care called this morning and said Bally had a good night. She rested well, she is breathing well, and her temperature is back to normal. They plan on performing blood tests this morning and are removing a catheter in Bally's chest that ensured all fluids were removed from her chest cavity. We were told that after surgery of this type the clinic keeps the patient two to three days to make sure all is well. Because Bally is refusing to eat the slurry they made for her this morning and is being "ornery", they think she would do better at home, so they requested we come get her THIS AFTERNOON. I didn't get much sleep last night thinking about all of the possible complications that could arise with Bally post-op. The storms passing through Louisville overnight, which caused the sirens to wail and our dogs to howl to ensure we didn't sleep through the warnings, made my attempts to sleep even more difficult. 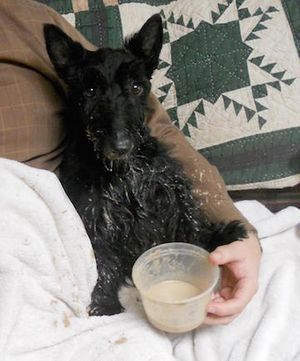 I told the vet assistant to try feeding Bally baby food, which Bally seemed to like after previous surgeries, and that we would prefer that she stay at the clinic one more day to ensure all is well and prevent possible complications. Having said that, if Bally is still refusing to eat and is unhappy at the clinic, we will be driving to Columbus this afternoon to bring her home. Update - My husband called the clinic, spoke with Bally's surgeon, end explained we would be more comfortable with having Bally stay at the clinic one more day. The surgeon said that was not a problem. However, if Bally still refuses to eat or she is miserable at the clinic, we will drive to Columbus today. February 2nd ~ Bally is Home: Just a quick note to let everyone know Bally is home and doing well. She ate a big dinner last night, went for a short walk, and spent the evening snuggled up against me on the sofa. Her breathing seems to be normal and she is active and alert. At the clinic they put a plastic cone around her neck because she kept trying to fang everyone, but at home she is happy and sweet. I will post a longer update later. We have been instructed to keep Bally calm and quiet, keep walks short, monitor her incision, and keep her from jumping on furniture or being overly active until her return visit to the clinic in two weeks. It will be a challenging two weeks! February 4th ~ Less than one week post-op, Bally is doing very well. She is regaining her energy, appetite, and alpha female mentality. 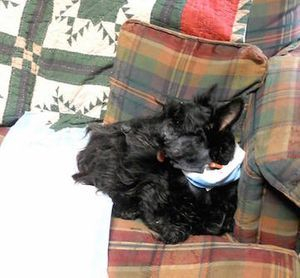 Unfortunately, yesterday we noticed that Walker, one of our 12 year old Scottish Terriers, was lethargic and was not eating. We took him to a local vet and an X-ray disclosed a growth in his lower intestine. We are awaiting test results. Because of Walker's age, he and his sister Yoko Ohno will be 12 years old February 13th, and limited funds due to Bally's recent unexpected surgery, we many not be able to do everything possible for Walker as we have for Bally. I am heartbroken. February 5th ~ The tests results showed Walker's kidneys are failing. The prognosis is not good. I plan to take Walker with us to the OSU Clinic next Monday for Bally's post-op checkup to get a second opinion, but that decision may be taken out of my hands. Walker is fading fast. Last Friday he was running around the back yard barking at squirrels and neighbors, and enjoying life to the fullest. Several times yesterday I found him in the backyard just laying in the grass or sitting by the fence staring at nothing. I had to carry him into the house because I was afraid he would get chilled. Walker is weak, sad, and not eating. 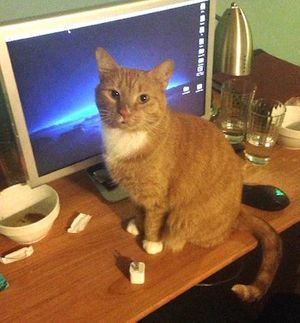 The vet said he is not in pain, but he prescribed an antibiotic to keep him comfortable. I had to force the medication down his throat. I am afraid it may be time to say goodbye to one of my old, beloved friends. February 6th ~ This morning Walker was not doing well. He coughed up the medicine I gave him last night. He was weak, but did not seem to be in pain. I carried him out into the back yard because that is what he wanted to do yesterday. When I went out to check on Walker a few minutes later, I found him laying on the grass. When I went to pick him up, he was limp. He had that big toothy grin that he always had. I had been telling myself all morning that today I would have to make one of the most difficult decisions of my life, but Walker made that decision for me. I am devastated, but the end came quickly for Walker. Up until a few days ago he was running around, barking in the backyard, enjoying walks, and spending time with those he loved and those who loved him. He lived a long, healthy, and what I hope was a happy life. At the moment he is laying on the rug in the kitchen, partially covered by a blanket. He looks like he is sleeping. I wanted to give his fur siblings an opportunity to say goodbye. This evening we will bury Walker in our garden where he will rest will all the others we have loved. Happy Days - Summer 2006 when we had a herd of puppies. February 12th ~ Post-Op Checkup: Yesterday my husband and I drove to Columbus for Bally's post-op checkup. The checkup was good and bad. The oncologist said Bally looked good, she was breathing well, and her blood tests were within the normal range. The bad news...she does have cancer in her remaining lung and they want to begin another round of chemotherapy. Also, there is a small possibility that the remaining lung could collapse and that would be the end of Bally. They would have begun chemotherapy yesterday, but the red mesh "coat" they put on Bally to keep her from irritating her incision dug into the under part of one of her front legs and caused a nasty wound. Because of Walker's recent illness and sudden death, and our focus on Bally's respiration and eating, we didn't notice the problem until Sunday. The oncologist cleaned the wound and gave Bally an antibiotic to assist, but Bally fought her so much...she tried to "fang" anyone who tried to touch the wound...that they had to sedate her. When we left the clinic, Bally was groggy and slept all the way home. 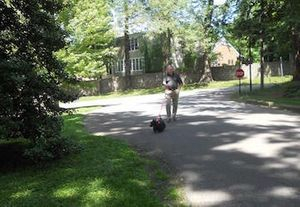 As soon as we got out of the car, Bally wanted to go for a walk and she ate a big dinner. Later that evening she attacked our wheaten Scottie Macallan because he jumped on the sofa while she was sitting on my lap. She got right on top of Macallan and forced him into a corner of the sofa. Pinch, Bally's brother, was so frightened that he hid in the kitchen until I realized he was "missing" and I called him. Another problem is that Bally has lost 4lbs, due to the collapse of her lung...which made it difficult for her to breath and eat, the surgery, and the pain from the undetected wound, so she is a very lean 16 pounds. Her appetite has increased in the past few days and she ate twice yesterday after we got home, but when my husband tried to get her to eat the food with her antibiotic in it, she refused to eat...another problem we don't need. I was very sad last night, probably because of the trip to Columbus, which is always stressful for me, and the fact that it is Ohno's 13th birthday tomorrow...something I had planned to celebrate with hamburger "cupcakes". It is also Walker's 13th birthday and my deceased mother's birthday, so it will be a sad celebration. We return to Columbus in one week. Our last photo of Ballantine. Bally (right) and Pinch sharing a small bed by choice. February 26th ~ Bally had another chemotherapy treatment yesterday, but they did not send her home with chemo pills like last week because blood tests showed she had a decreased white cell count. They gave her another shot of antibiotics to prevent stomach problems and she has to return next week to be retested. She lost one lb. this week, after gaining two lbs. last week, but she didn't eat well Sunday night, she did not receive her "before bedtime supplement feeding" because my husband went to bed early, and she did not eat well yesterday morning because we fed her at 5:00am instead of 7:30 am which is her usual morning feeding time. We are always stressed the evening before and the morning of our trips to Columbus and I am sure Bally feels the stress and anxiety. The good news was Bally's respiration was good and her lymph nodes did not show signs of the cancer spreading. We are at the point where we are taking everything a day at a time and every day Bally is active, eating well, and clear eyed it is a good day. 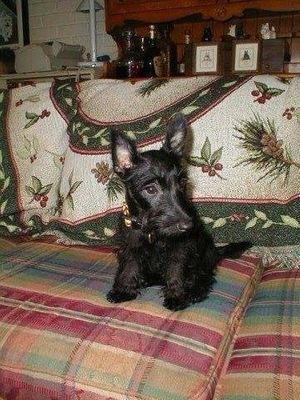 March 3, 2013 ~ Yesterday my Scottish Terrier Ballantine lost her 21 month battle with cancer. Her end was swift, but not totally unexpected. After one of her lungs collapsed and had to be removed one month ago, I had been preparing myself mentally for the possibility that her days were numbered, but Bally had fought so hard and so long, overcoming every obstacle and challenge placed before her, that I wanted to believe that she would continue to win her fight against this heartless, invisible enemy. Bally underwent chemotherapy at the vet clinic at OSU last Monday and, despite the temporary lethargy brought on by the treatment, she seemed to be improving every day, she was eating well, continued in her role as the alpha female, and spent evenings cuddled in my lap or keeping an eye on her herd of siblings. Saturday morning I noticed her breathing was labored. I held her and told her how much I loved her. I put her in her bed and turned off the lights, so she could rest. While I was gone, she went to the backyard. When she did not return immediately, I became concerned. My husband found her lying by our koi pond, one of Bally's favorite places. Last night we buried Bally in our "woodland" garden with her worn and much loved bed. She now lies under a garden bench near Walker's final resting place. The two were great friends. I am trying to take the advice of others who have suffered similar losses - concentrate on the gift and not the loss. Bally and Walker were gifts who brought me daily joy and laughter and I will miss them both as long as I live. March 5th ~ It has been a rough day for all of us. When I woke up at 7:00am I felt like I was late for something. My son or my husband and I should have been on the road, traveling to Columbus for Bally's appointment at the vet clinic at OSU. When I went into the kitchen, only three dogs were waiting to greet me...not five. At 10:30am I realized that I should have been sitting at the clinic, waiting for an assistant to take Bally to the back room for treatment. Bally would be sitting on my lap, looking at every dog and cat that passed by, waiting patiently while I stressed out. I would stroke her back and assure her (actually I was trying to reassure myself) that all would be well. At noon my husband came home and there was no Bally to feed. He said he doesn't know what he will do with the three extra hours he has each day. While my husband ate lunch, I sorted through the basket of Bally's pills and medications that were on top of our toaster oven, bagged them up, and was at a loss as to what to do with them. Bally's new soft harness, the one we bought her one month ago after her lung collapsed, was sitting on the kitchen table. I moved it to the living room stairway with the leashes and other harnesses...way too many for the three remaining dogs. My son, who is off from work on Mondays, is sitting on the sofa, watching a movie. If we were in Columbus as planned, we would have been watching a movie together at a nearby theater, trying to keep from thinking about Bally, the treatment she was receiving, and the news, good or bad, we would receive when we went to pick her up. The walk into the clinic and the time waiting were like walking "the green mile." As the minutes passed, my stress would increase. The drive home was always a relief...even if the news was bad. We knew we had another day or week with Bally. We would stop at a Dairy Queen for a treat...our reward for getting through another visit to the clinic. When we watched TV in the evening, we were all too aware that our "herd of puppies" has been greatly reduced. The three remaining dogs are subdued. There is no run and chase, vying for positions on our laps, or an alpha female controlling the actions of the pack. I miss having Bally curled up on my lap and watching Walker lick the carpet and rub against the ottoman, which we once considered to be annoying habits. Every night Walker would sit up, bark, and look at me with his human-like eyes and snaggle-toothed grin, waiting for me to tell him it was okay to go outside. I miss the final evening run, herding five dogs into the kitchen at night, and saying one last "good night" before I went to bed, knowing all was well in our little world. Last Friday, when I told the dogs it was time to go to the kitchen, Bally led the pack, which was unusual since most nights I had to carry her to the kitchen and place her on her bed because she was one stubborn girl. If I had known it was going to be her last evening with me, I would have stayed up later...If, If, If. And then we had three...Macallan, Ohno and Pinch. The photo was taken a few days before Ohno passed away from kidney failure. She was 14.5 years old. P.S. The choice I made for Bally was very expensive. A Facebook friend created a chip-in for Ballantine to help offset the cost of Bally's medical care. I want to thank everyone who donated towards Bally's medical bills. I don't have enough words to express the gratitude I feel. Knowing that there are good, generous people who are willing to help one little dog they have never met has given me hope on those days when I felt nothing but despair. In a short period of time I went through every stage of grief while trying to make decisions in Bally?s best interests, trying to figure out how to pay for Bally?s medical bills, caring for Bally, updating the website, cross-posting animals in need on Facebook, and trying to keep myself sane. Knowing that there are people who care about Bally has been a lifeline for both of us. March 3, 2014 ~ In memory of my Ballantine who left us one year ago today. She was more than "just a dog" to me. Miss you Bally. March 3rd, 2015 ~ Ballantine left us two years ago today at age 7. Gone from my side, but not from my heart. a piece of my heart bound up with his forever. Walker and Ohno were siblings that were going to be turned over to animal control because their elderly owner had passed away. 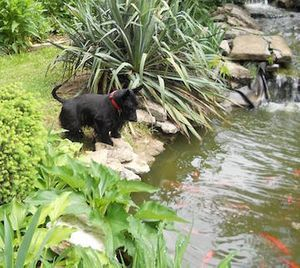 The owner's son, who owned Ohno and Walker's mother as well as another Scottish Terrier, decided that four dogs were too much to deal with. I was contacted by the rescuer from whom we adopted Ballantine, Pinch, and Macallan, and offered to travel to Cincinnati to pick up the two unwanted dogs with the intention of putting them on a plane and sending them to rescue. 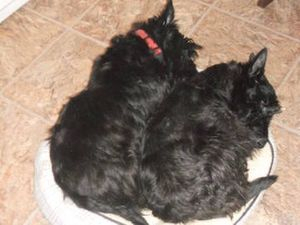 As my husband and I drove back to Louisville, with the two dogs in the back seat of our car, their crates in the trunk, and a folder filled with medical records and "baby" photos of Ohno and Walker on my lap, my heart broke knowing that these two big, beautiful, muscular Scottish Terriers could be disposed of so easily. Since both dogs needed a certificate to travel, we took them to our vet. As we waited in the vet's waiting room, both dogs pressed against my legs for comfort. It was that moment when I realized I could not abandon them. My family offered to foster Ohno and Walker until a permanent family could be found who would adopt both of them, since they were obviously bonded. Weeks passed and my attachment to Ohno and Walker grew. At some point I asked the rescuer if it was possible for Ohno and Walker to become permanent members of our family. She agreed and our family of three became a herd of five puppies. Ohno and Walker adapted quickly to being two of five. Ballantine, who had assumed the role of alpha female on our trip home from adopting her, retained her position because Ohno was so easy going. 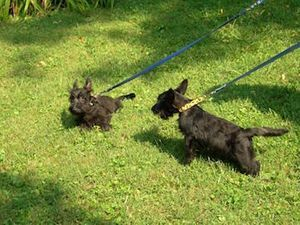 Walker, who was the largest of the five Scotties, bonded quickly with Ballantine, ignored Pinch, and played gently with Macallan who was only four months old when Walker came into our household. He and Bally would spend so much time together in our backyard that we often joked that they were "dating." As fate would have it, Walker showed signs of being ill while Bally was undergoing treatment for cancer. He passed away three weeks before Bally. As difficult as it was to lose both of them in such a short period of time, I found some comfort in hoping that they were still together somewhere, chasing after squirrels and enjoying each other's company. She only wanted two things in life - to love and to be loved. We rescued Angelica from a high kill shelter in Nicholasville, KY where she was overlooked week after week when they killed animals for space. When they remembered her and put her on the kill list, I offered to take her. The shelter thought she was a he. Her true gender was discovered when she was transferred from the shelter to a vet's office to be neutered. We named our new family member Angelica. Angelica was a people cat. She loved human companionship. She would sit on my son's lap when he sat at his computer, stole food from his plate when given the opportunity, slept on my son's bed, and when the nights got cold, she would snuggle under the covers with him. When I entered a room where she was sitting, Angelica would run up to me and greet me with a cry. She enjoyed sitting on laps, being petted and snuggled, and communicated her love and happiness with a rumbling purr and use of her voice. Angelica was a very talkative cat. She vocalized when she wanted to be fed and carried on a conversation with you if you spoke to her. She had a sweet personality and was very loving and lovable. In December 2014 we noticed that Angelica was losing weight. We took her to our vet and he initially suspected that Angelica had a thyroid problem. On January 11th, 2015, Angelica was diagnosed with diabetes. We were instructed to give her 3 units of insulin twice/day and to monitor her for any changes. For four months Angelica appeared to do well on insulin, but she did not regain the weight she had lost. On May 18th Angelica lapsed into a diabetic coma. We discovered her half hidden under a dresser. 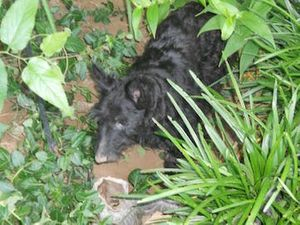 When we could not revive Angelica with corn syrup, as we had been told to do if a such a situation arose, we rushed her to the nearest vet's office where she was revived and stabilized. When we presented to the vet's office, Angelica's body temperature was 92 degrees, far below the average cat body temperature of 103 degrees, and her blood sugar level was so low that it was unreadable. I thought we had lost her. The treating vet said our quick actions saved Angelica's life. That evening we transferred Angelica to an emergency clinic where she could be monitored overnight. She was released to us the following day and the next day we took her to our vet. For three weeks my son and I tried to get Angelica healthy again. We were told to give her one unit of insulin twice/day, but when she started to dehydrate every few days, requiring her to be hydrated at the vet's office, all insulin was discontinued. Angelica continued to eat and use her litter box, but she continued to lose weight...and she was already very thin. On Wednesday June 3rd, Angelica had a very good day and seemed to be on the mend. She groomed herself, ate voraciously, and seemed to be her old self. Despite the improvement, which included a weight gain of half a pound in two days, Angelica's vet did not suggest other treatment options and did not offer further testing, which had been recommended by the emergency clinic upon Angelica's release, to determine the underlying cause of her problems. I had already decided to take one day at a time and to make Angelica as comfortable as possible for as long as she had a good quality of life. Seeing the improvement as a good sign and believing that our vet had given up on Angelica, I contacted friends who had cats and found a new vet who specialized in cats and came highly recommended. We made an appointment with the new vet, but prior to the appointment, Angelica began to lose weight again while continuing to eat and drink. Although she was weak, thin, and fragile when we presented to the new vet, he said if we could get Angelica's diabetes under control, we could work on making her healthy again. I told the vet I would not go forward with further treatment if I was only prolonging the inevitable. I did not want Angelica to suffer. The vet said he had treated other cats who had been in worst condition who had been brought back to good health and that although we had an uphill battle, the situation was not without hope. On Wednesday June 10, the vet tried a new insulin on Angelica, which we were told cats could tolerate much better than the insulin Angelica had been receiving. Unfortunately, even though the dosage was very small, Angelica could not tolerate any insulin. She crashed again and we had to make the difficult decision to let her go. My husband was with her at the end because neither my son nor I could handle the loss. I was also racked with guilt because I knew that I should have made the decision to let Angelica go on Sunday, which was her last good day. Sometimes hope is a terrible thing. There must, whether the gods see it or not, be something great in the mortal soul. For suffering, it seems, is infinite, and our capacity without limit. Angelica was brought home to us in the blanket I used to bundle her in when she looked cold or had to be transported to the vet for her many office visits. That evening we buried her in our garden near all of the others whom we have loved and lost. or prepare our hearts to say goodbye. 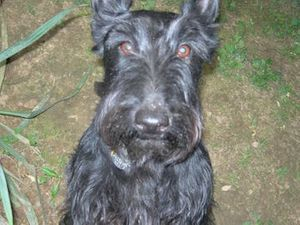 Ohno was the oldest Scottish Terrier we have ever had. She looks sad in the photo, but she was a very happy girl. She had no physical problems, loved to go on her daily walk, tried to play with her "brothers" who weren't as playful, spoke to us to get our attention, and hopped with joy. We fostered and then adopted Ohno and her brother Walker when they were six years old. Their elderly owner had passed away and the two siblings were going to be relinquished to animal control by family members. Their mother was owned by the elderly owner's son. 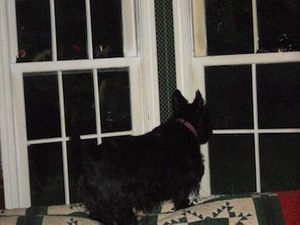 One of the sad memories of the day we "rescued" Ohno and Walker was going to the son's house and seeing four Scottish Terriers standing outside a sliding glass door, looking in at us. The son pointed to two of the four and said those were the ones we could take. Along with Ohno and Walker, we received their crates and "baby" photos taken by the son shortly after they were born. I can't imagine how anyone could give up such a sweet, wonderful dog, but his selfishness was a wonderful gift to our family. Ohno came into her own after Bally and Walker passed away. She could have become the alpha female, but instead she remained docile, sweet, and content to be one of three. My fondest memories of Ohno are of her walking around the house and yard carrying "her babies" - the toys that we kept in a basket in our family room. Two years after her passing, I am still finding "babies" in the yard. Mama Cat with two of her babies - Pappilon (left) and Leo (right) in happier times. I found our mama cat dead this morning, lying on the rug on her side. I thought she was sleeping when I first walked past her, but when she didn’t come running when I filled her food bowl, I realized something was terribly wrong. Only when she didn’t respond to my touch did I realize she was gone. Her passing is a total shock. She was fine when I last saw her yesterday and other than the fact that she was grossly overweight (which may have been the cause of her unexpected demise), she appeared to be healthy. Mama Cat was about a year old when my daughter brought her to me from a farm in Nicholasville, Kentucky with nine kittens - only some of them belonged to her, but all were destined to be disposed of like trash. She was rail thin and couldn’t walk because she had a dislocated hip. All ten cats were covered with fleas. Mama Cat (the only name other than Tubby Mama that ever seemed right for her) nursed all nine kittens without complaint and, as time passed, her hip healed and she grew plump and content. Over the years some of Mama’s “babies” left us for other homes or due to sudden illnesses from which they could not be saved. Ultimately, only Mama and four “kittens” remained. My younger son recently bought a house and planned to move all five of the cats with him where they would have their own room with large windows, run of the house, and access to a deck and fenced-in yard. Mama had not been outside except for visits to the vet since she came to us. She seemed happy to be an inside cat and not have to worry about constantly being pregnant or earning her keep on a farm by killing rodents. I hated to tell my son that Mama Cat had passed away because he wanted to move the cats to his house yesterday and I convinced him that they should stay with me until he gets their room ready and can spend two full days with them to get them acclimated to their new home. He was going to give them a wonderful life, with more space to roam and places to have new adventures. Now Mama Cat will never have a chance to enjoy the new home with her family. I foolishly believed the Grim Reaper would pass us by this year since we lost Angelica and Ohno last year. I guess it was not meant to be. I will miss you Mama Cat. I would have stayed right next to you deep into the night, but I thought I'd see you in the early morning light. And so I said "Good night" to you as I walked in through the door never thinking of the time when I'd see you no more. When I am old...I will wear soft gray sweatshirts...and a bandana over my silver hair...and I will spend my social security checks on wine and my dogs. 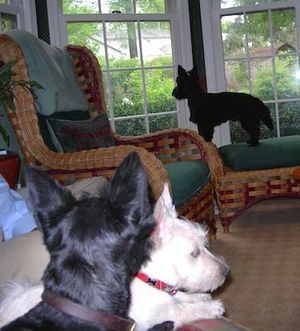 I will sit in my house on my well-worn chair and listen to my dogs' breathing. I will sneak out in the middle of a warm summer night and take my dogs for a run, if my old bones will allow. When people come to call, I will smile and nod as I show them my dogs...and talk of them and about them...the ones so beloved of the past and the ones so beloved of today. I will still work hard cleaning after them, mopping and feeding them and whispering their names in a soft loving way. I will wear the gleaming sweat on my throat, like a jewel and I will be an embarrassment to all...especially my family...who have not yet found the peace in being free to have dogs as your best friends. These friends who always wait, at any hour, for your footfall...and eagerly jump to their feet out of a sound sleep to greet you as if you are a god. With warm eyes full of adoring love and hope that you will always stay, I'll hug their big strong necks...I'll kiss their dear sweet heads...and whisper in their very special company. I look in the Mirror...and see I am getting old. This is the kind of person I am...and have always been. Loving dogs is easy. They are part of me. Please accept me for who I am. My dogs appreciate my presence in their lives...and they love my presence in their lives. When I am old this will be important to me. You will understand when you are old....if you have dogs to love, too.